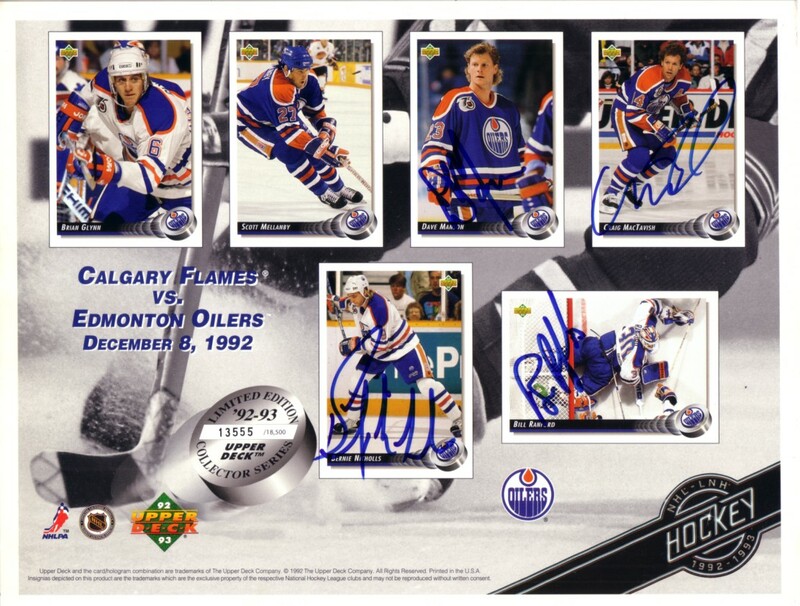 8 1/2 by 11 inch commemorative card sheet distributed exclusively at the December 8, 1992 Edmonton Oilers home game autographed in blue marker by 4 of the 6 players featured: Craig MacTavish, Dave Manson, Bernie Nicholls and Bill Ranford. MacTavish and Ranford were key members of the 1988 and 1990 Stanley Cup winning teams. Has minor wear. Obtained in person. With certificate of authenticity from AutographsForSale.com. ONLY ONE AVAILABLE FOR SALE.